A focus on local impact and family. 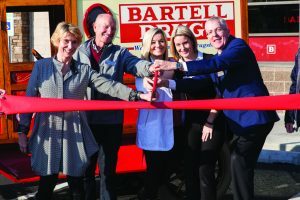 SEATTLE — Founded in 1890, Bartell Drugs has maintained a leading position in the greater Seattle market by staying close to local consumers and continually developing new ways of addressing their changing needs. In light of Bartell’s success in leveraging those assets and consistently delivering Red Vest Service to patients and shoppers, the editors of Chain Drug Review have named the company the publication’s Regional Chain of the Year. The person who, along with Bartell and his sister, vice chairman and treasurer Jean Bartell Barber, is most responsible for building on that legacy is Kathi Lentzsch. A proven retail leader with more than three decades of experience in a variety of trade channels, Lentzsch became the company’s chief executive officer in January. Prior to that, Lentzsch held executive positions at leading retailers including Pier 1 Imports, Cost Plus World Market and Williams Sonoma/Pottery Barn, where she oversaw the turnaround and repositioning of Pottery Barn as a premium home brand. Lentzsch also has experience in the drug channel from her tenure as president and CEO of formerly Berkeley, Calif.-based Elephant ­Pharmacy. Lentzsch’s journey to Bartell’s started with a call from a recruiter. Although she wasn’t looking to make a move at the time, Lentzsch says “my ears perked up” when the recruiter mentioned Bartell’s. “Someone at Elephant Pharmacy told me, ‘There’s nothing like Elephant in the country, but the closest might be Bartell’s.’ Because of that, I wanted to talk to them,” Lentzsch says. What attracted Lentzsch the most to Bartell’s is that the company is all about a focus on local impact and family, she says, “which is my passion.” So Lentzsch packed up her life, left “28 years of friends behind” and headed to the Pacific Northwest to settle down in Seattle. In her first few months on the job, Lentzsch says her primary focus was on the company’s implementation of a new ERP (business management software) system and the construction of a new warehouse. And as often happens in large organizations, Lentzsch says the company fell behind schedule. “I could not spend much time on the brand and focused on the operational side of the business. We had to get the systems working,” she explains, noting, however, that the ERP system has since stabilized and the new warehouse is running smoothly, providing the company with double the square feet of its previous facility. That allows Bartell’s to work with more vendors ­directly. In her short time with the company, Lentzsch did find time to work on the brand and sharpen the focus on what Bartell’s stands for — “how we continue the legacy.” It’s important to Lentzsch to get to the essence of the brand and not alter what the Bartell family has built, but instead bring the essence forward and make what they established more contemporary. Stock issues, Lentzsch notes, are more than just inconveniences to customers. She believes lack of inventory takes a toll on the morale of the workforce, and customers can sense that. Beebe says Bartell’s is focused on staying true to its core values — the values that have made the company a success for more than a century. And that means not following some of the bigger competitors. “Our front-of-store business is a huge part of our business and is extremely important to us,” Beebe says, adding that because he can’t “out-CVS CVS or out-Walgreens Walgreens,” he competes on selection. “When you’re in Bartell’s, I encourage you to go and look at a category that you’re familiar with. I bet my selection is exponentially higher than some of the traditional guys,” Beebe says. But as important as the front end is to Bartell’s, pharmacy is its bread and butter — and vice president of pharmacy Billy Chow sees pharmacy as an industry heading toward skilled services and no longer one primarily based on commodity dispensing. Chow cites immunizations as an example, but also moderate ailment triage, which some Bartell’s pharmacists are providing in partnership with Washington State University under the auspices of a CDTA (Collaborative Drug Therapy Agreement). “So, the pharmacists who have gone through the training program will be able to prescribe and initiate therapy on things like noncomplicated UTI, or upper-respiratory issues and animal bites,” Chow says. Bartell’s CareClinics further enhance the skilled services the company offers its patients. These clinics, staffed by Kaiser Permanente clinicians, provide immediate care to patients 2 years old and older, regardless of insurance, for minor illnesses and injuries and preventive care, such as ­vaccinations. The task of bringing the diverse strands that comprise Bartell’s together at store level and ensuring that the expectations of shoppers are met falls to senior vice president of operations Adam Wampler. A veteran retailer with more than three decades of experience at supermarket operators Safeway Inc. and Albertsons Cos. (which acquired Safeway in 2015), he joined the drug chain early last year. Wampler understands that for Bartell’s the outcome of the battle for the hearts and minds of consumers is determined by the experience they have in-store. Wampler practices what he preaches, spending as much of his time as possible in the field. During interactions with district managers, store managers, pharmacists, cashiers and other associates, he leads by example. On a recent series of store visits, he frequently stopped to assist customers, adjust holiday displays, and even pick up trash in the parking lot. Looking ahead, Lentzsch sees Bartell’s continuing to build on its long tradition and getting even stronger in the coming years. She believes the Bartell’s brand is robust enough to eventually expand outside of greater Seattle to other parts of the Pacific Northwest and beyond, but for now her focus remains on perpetuating the Bartell’s legacy and running the company in keeping with that tradition.